Peggy Henderson is expecting to have a quiet summer at her home in British Columbia when instead she scores the opportunity to join her friend Dr. Edwina McKay at an excavation site in Newfoundland. Peggy’s been on digs with Dr. McKay before, but this time she’s having a tough time getting away from her job as cook’s assistant in order to actually be a part of the dig. When Peggy does get away, she manages to discover an important Viking site, but due to several factors she’s immediately banned from the site. Will she ever get credit for her discovery? This is the fourth adventure in the Peggy Henderson Adventure series. I haven’t read the previous books, and it can be difficult starting a series in the middle. That said, I thoroughly enjoyed A Bone to Pick and had no trouble relating to or understanding the characters. It read well as a stand-alone book. A Bone to Pick would be great for kids with an interest in history, anthropology, or forensics. As a history buff and fan of Kathy Reichs’ Temperence Brennan mysteries, I greatly enjoyed those aspects of the books. Peggy is a flawed, enthusiastic, and fun character. She’s very knowledgeable and driven to learn all she can about archaeology, but strives to be taken seriously by the college students on the dig. Now that I’ve read this one, I’ll be looking for the previous Peggy Henderson stories so that I can catch up on her escapades. 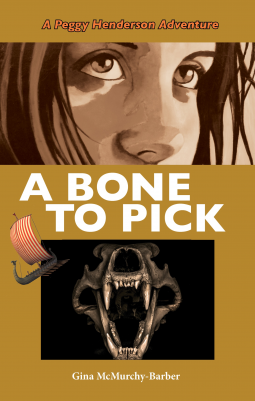 I read A Bone to Pick as an electronic advance reader copy courtesy of Dundurn and NetGalley.